From intelligent highways to driverless vehicles, robotic vehicles are set to change the way that we get around in the future. The developments in this field over the past decade have been amazing. 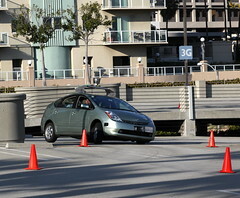 For example, by August 2012 Google’s driverless cars had completed over half a million kilometres accident-free. This unit consists of three tutorials and one open-ended challenge. To complete this unit, you will need to work through the tutorials and then complete the final task, which is to create, and demonstrate, your own challenge related to transport! Design, build and program a method for autonomous or remote control transport for a specific need.